Fruit: that’s got to be good for your dog, right? The answer is yes and no. Exotic fruits contain lots of vitamins and antioxidants – great for dogs. But they can also have a high sugar content and cause digestive issues and other problems. Not so good. Our Lead Nutritionist, Dr Samantha Ware, explains which exotic fruits are OK to give your dog. Which exotic fruits can dogs eat? When prepared in the right way, some exotic fruits are a tasty, low-fat snack for dogs. 1. Can dogs eat bananas? They can! Bananas cram a lot of nutrition into a small dog-friendly package. They’re full of potassium, fibre, beta-carotene, vitamins C and E, lutein and selenium. Always remove the peel, and serve in moderation to avoid giving your dog too much sugar. 2. Can dogs eat coconut? Coconut oil is often recommended for dogs because it has antibacterial properties. But can dogs eat coconut flesh? You bet. Coconut contains medium-chain triglycerides, which are a great source of energy, may have anti-inflammatory benefits, and can help keep your dog’s coat in good condition as well. 3. Can dogs eat kiwi fruit? Yes, this tasty superfruit is packed full of vitamin C, vitamin K, vitamin E, folate, and potassium. Remove the skin and seeds though – these are edible for us, but not so digestible for dogs. 4. Can dogs eat melon? Occasionally, yes. Melon is packed full of fibre and vitamin C, and is a good source of the antioxidant superoxide dismutase (SOD) – an enzyme that reduces the number of unstable, cell-damaging atoms in your dog’s body. But melon is also high in sugar, so it’s definitely a treat to avoid if your dog is diabetic. For other dogs, small portions of melon can be a tasty treat – remove the rind and seeds before serving. 5. Can dogs eat mango? Small servings of mango make a great sweet treat for your dog. It’s bursting with nutrients: vitamins A, C, E, and K, plus B6, folate, riboflavin and choline. It also contains minerals: iron, potassium, calcium, phosphorus, sodium, copper, zinc and selenium. And antioxidants, carotenoids, polyphenols and vitamin C. Phew! Preparing mango for dogs is the same as it is for us – peel it and remove the stone before serving. 6. Can dogs eat papaya? As long as you remove the seeds first, papaya is a dog-friendly source of fibre, and vitamins A, E, C and K. These antioxidant vitamins help support your dog’s immune system. Papaya also contains folate, potassium, magnesium and calcium, and is a good source of the enzymes papain, chymopapain, caricain and glycyl endopeptidase. These enzymes support healthy digestion in dogs and are thought to be beneficial for their dental health too. 7. Can dogs eat pineapple? Pineapple is a great sunny day snack and a good source of manganese, which helps keep joints healthy. And thiamine, which aids digestion. It also has plenty of vitamin C and beta-carotene. Planning to give pineapple to your dog? Remove the core and skin, and serve a small portion of the soft flesh. 8. Can dogs eat watermelon? Watermelon is over 90% water, so it’s great for keeping your dog cool in summer – see our post about frozen watermelon treats. On top of that, it’s a great source of vitamins A and C, and some B vitamins too. It also gives your dog a boost of minerals including copper, potassium and magnesium. As with other fruits, make sure you remove the rind and seeds before serving. What about other fruits? Read our blog: Can dogs eat fruit? Which exotic fruits are harmful to dogs? While some exotic fruits are OK to give your dog as an occasional treat, some are important to avoid. 1. Can dogs eat acai berries? Nope. These popular superfood berries contain theobromine (the same stuff that makes chocolate a no-no), and ficin and ficusin, which can cause serious allergic reactions. 2. Can dogs eat kumquats? While we can eat these sweet and sour fruits whole, the rind is bad for our dogs, so they’re best avoided. 3. Can dogs eat jackfruit, breadfruit, rambutan and noni? These, and other fruits that are new to the market, haven’t been studied in enough depth to be certain they’re safe for our dogs. On the whole, there’s no evidence these fruits are harmful – but some dogs may react differently. How can I introduce tropical fruits into my dog’s diet? 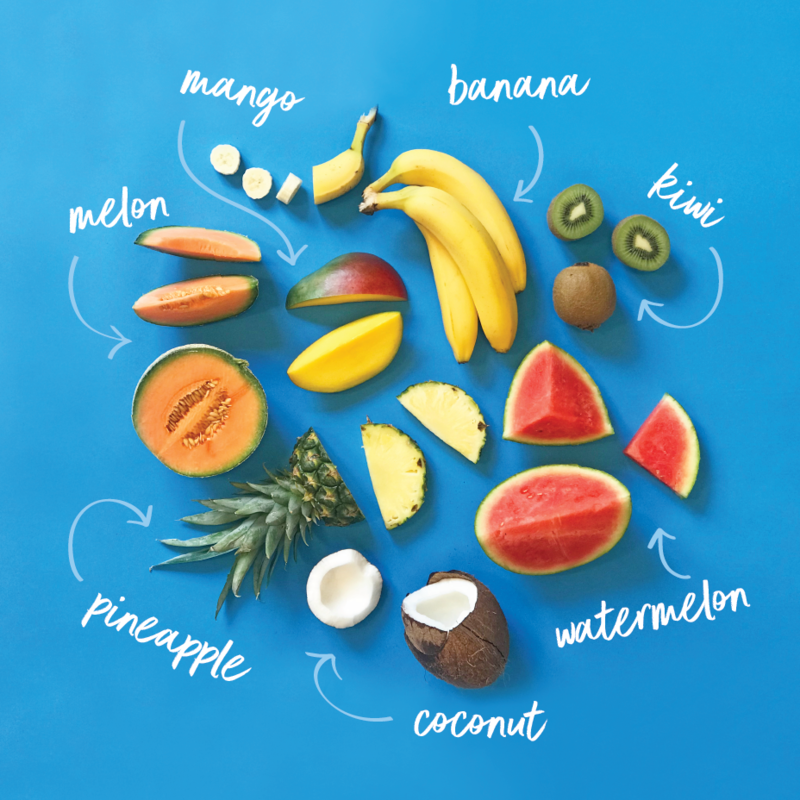 Exotic fruit is packed with healthy nutrients but is also high in natural sugars. That means indulging your dog with too much could lead to digestive issues and weight gain. Keep those portions small. When you add anything new to your dog’s diet, you should keep an eye on how they react. If they end up with an upset tummy, you need to be able to identify the culprit – so stick to one new fruit at a time. Avoid feeding your dog fruit that’s spoiled or past its best. If you don’t want to eat it, your dog shouldn’t either. Any fruit you feed your dog should be carefully prepared to remove skin and seeds. That means it’s important to keep fruit trees out of bounds for your dog, as they could easily nab a bite of something that’s fallen off or spoiled. I am so pleased to have found tails.com! I have 2 pappillon dogs and both were very picky eaters! Constantly changing foods and not seeming to like any, but thankfully now they both have food tailored to their specific needs and both gobble up their food at mealtimes! Molly and murphy are now happy which makes me happy! Thanks tails.com! You could read the ultimate article “What fruits can dogs eat?” for more details.